There are some days, I think, that The Boy regrets choosing a cat person for his lifetime partner. Not that he doesn’t has a beautiful, fulfilling relationship with our little fuzzies, but days like today might make him think of Kitten Thunder as MY cats for a couple minutes. There was stuff on the chair that Oliver uses to get up on the layout so he was walking around trying to find a way up. He was speed walking from my workshop to the closet, seeking that halfway point. Obi, who can easily make the jump, was also feeling a bit lazy and decided to use a halfway point. Unfortunately, he chose the wrong point. He jumped, set his feet on an engine that was sitting on a short bit of track on a low shelf, and lost control as the engine rolled. He managed to get his front paws up to the layout and frantically tried to pull himself up. After witnessing the struggle, and the damage a flailing brown kitten can do, The Boy helped him the rest of the way up. 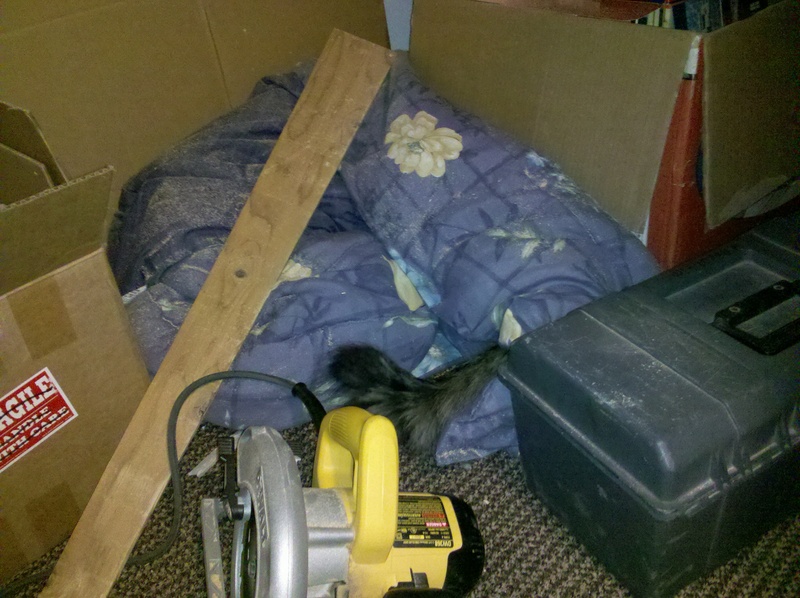 Then he retrieved all the stuff that had been knocked to the floor. Meanwhile, the grey kitten remembered the hole in the layout and the trunks that he can get onto in order to access the hole. The Boy suggested he jump up toward the section with no track. Oliver chose to jump up onto the tracks. His dainty feet, luckily, allowed Oliver to land without hitting any of the tracks or the boxcars on them. He did a quick survey of the tracks before coming to sit next to me…and the grain silo. The silo is the perfect height for chin scratching. “Oli, stop.” Scratch. Nose swat. “No.” Scratch. Nose swat. Scratch. “Stop.” Scratch. Nose swat. Finally he went to the corner of the layout to mark it as his own. He’ll finish claiming the silo later when no one is looking. I hope it gets finished – and will be more sturdy – before it breaks. 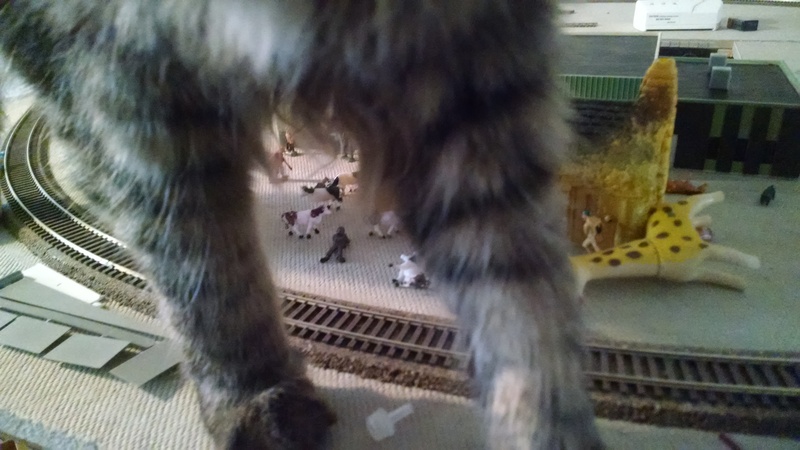 Obi also did a cursory survey of the tracks before seeking out things to knock off the layout. He paused to kill some cows at the farm before doing after tools. As the first tools dropped, I decided to put The Boy out of his misery. “Come on boys, lets go watch a movie.” Oliver ran to the hole and hopped down on the trunks. Obi made the leap all the way to the floor. And they thundered up the stairs to the living room. We left The Boy, relieved, in the basement. I work out in the basement by the train layout. I was laying on the floor for sit ups when something hit my forehead. I’d been paying attention to the TV so I didn’t know what it was. Then a AA battery fell from the sky and barely missed me. 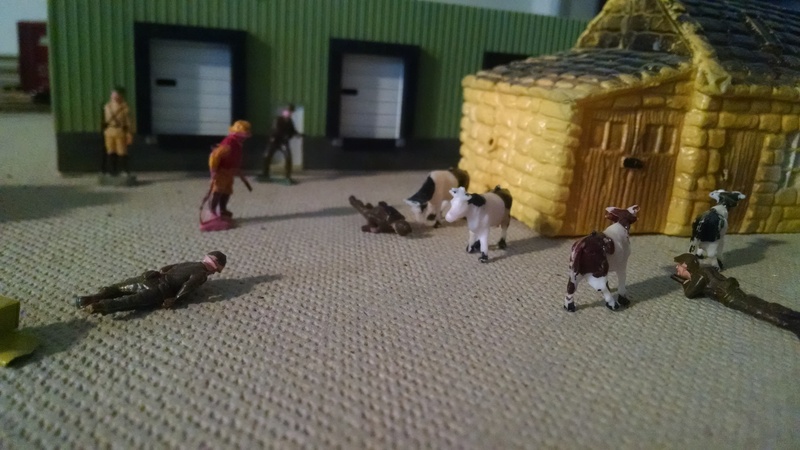 The farmer has been concerned about his livestock. 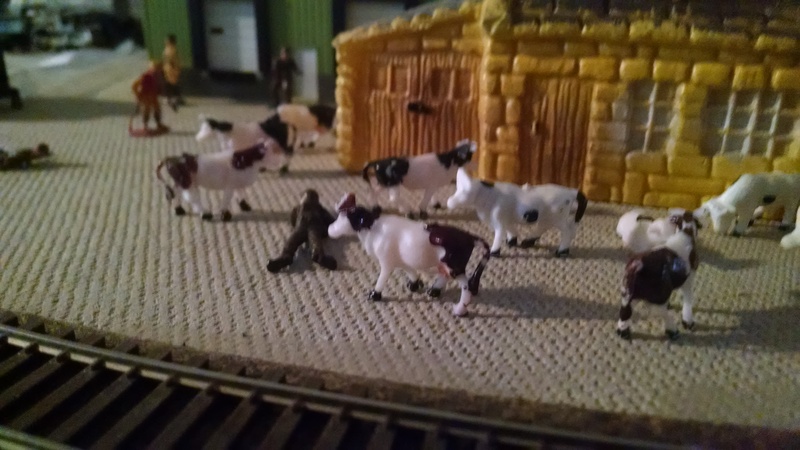 Every once in a while he walks out of his house to find his cattle wiped out. Ten head of cows, left to rot on their sides in the yard. The pigs have also been victims of this strange phenomenon. Fed up, the farmer grabbed his rifle and stood guard. 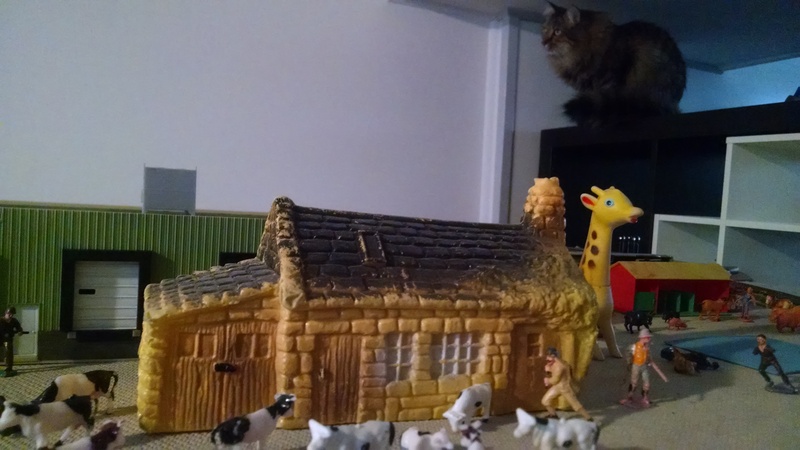 He left one dead cow at the corner of the house to attract whatever was attacking the livestock. Finally, a lion came by. A tiny fellow, this lion sniffed at the fallen cow. Feeling that the mystery was solved, the farmer raised his rifle to dispatch the threat. 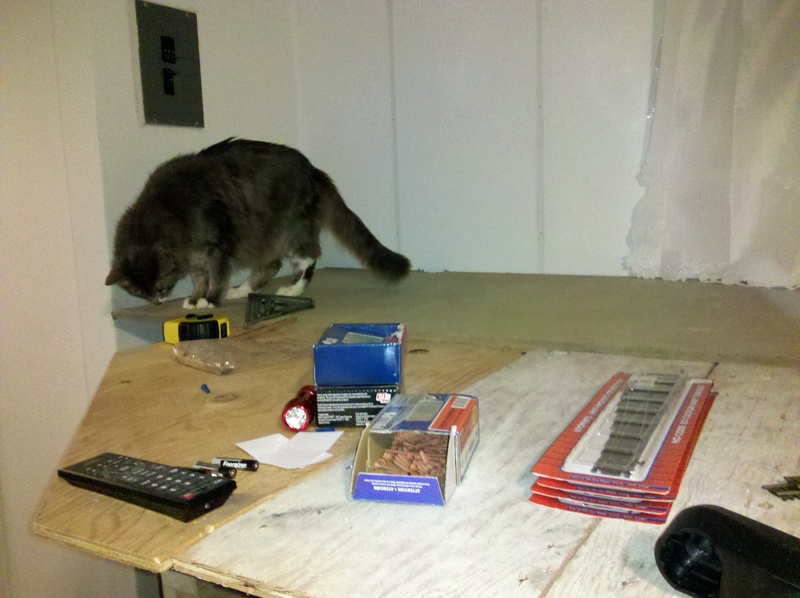 While The Boy and I were standing around, discussing the weekend, Kitten Thunder checked out the progress on the layout. 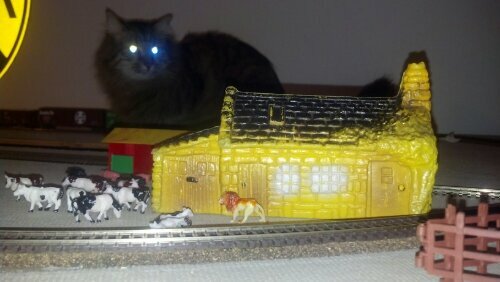 Oliver does not approve of the height of the layout. The chair he uses to get up to it had stuff on it. 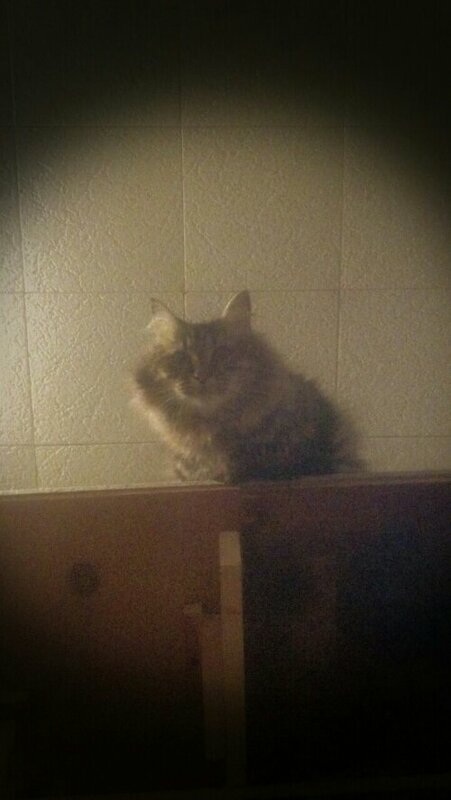 It took him at least two minutes to find a way up. Then he had to get down. We didn’t make him jump. The Boy set him on the floor. 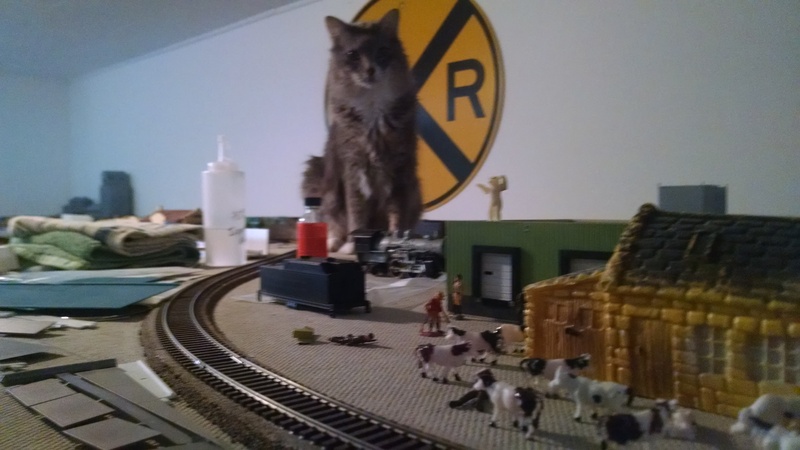 Obi just jumped straight up to the top of the layout. He has no issue with that sort of thing. What he does have an issue with is photographs. It’s Thunder Thursday! I thought we’d check in on Oskar and Klause. In case you don’t remember them, Oskar was born without eyes. He’s on the right in this video. It’s amazing that this game is still interesting to him.